Learn to be a blacksmith. No, really. Blacksmiths may seem like a bit of an archaic concept, kind of like outhouses and the horse and buggy. But in some circles the art of blacksmithing is still alive and well. Locally there's a group of blacksmiths that run a forge at the Normanskill Preserve, and they're hoping you'll come check them out and maybe even try it yourself. Apparently it's not just for horseshoes anymore. Blacksmiths did traditionally make horseshoes, but once places like the local Burden Iron Works Company developed faster and much more efficient ways of producing them, that sort of fell to the wayside. They made other things as well: nails, hooks and other items made from steel, but most of those things are now made in factories, too. These days blacksmithing has become more of an artisan craft and it's actually having a bit of a resurgence. Today's blacksmiths make things like ornamental gates, grappling hooks, latches, decorative garden stakes -- all kinds of stuff. Some blacksmiths create historically accurate copies or make repairs to original ironwork. Bethlehem resident Jim Moran has been blacksmithing since 1972. Moran says he got into the craft because he liked the idea of taking something -- in this case, pieces of iron and steel -- that would be discarded and turning it into something useful. One of his projects is actually a coffin. Yes, really. 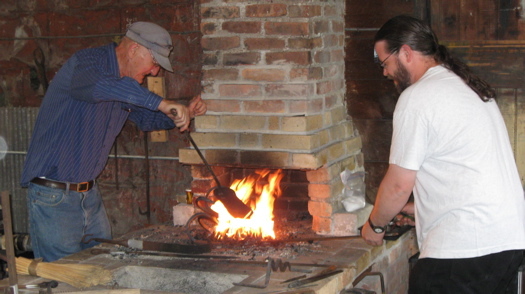 A few years ago Moran was asked to do some demonstrations on a restored forge at Normanskill Farms. I watched one of those demonstrations over the weekend. Basically blacksmithing involves heating iron and steel until it's really hot -- usually when it's literally red-hot (the forge is an oven that reaches 3,000 degrees) -- and then shaping it by hand using a variety of forging tools and chisels on a giant anvil. It sounds kind of weird, I know, but it's actually very cool to watch someone take a stiff piece of steel, heat it and then transform it into a funky, curved belt buckle, a fleur-de-lis or some sort of tool handle. There's almost something a little magical about it, and it's a hobby that doesn't have to cost a lot of money, either. Safety goggles are a necessity though, as sometimes burning embers go flying when you're forging. I nearly found this out the hard way when I got a little too close while trying to get a better look. Oops. There's a pretty active community of blacksmithing enthusiasts around the area who get together to practice forging techniques, hold conferences, share tips, put on forging contests and much more. Moran is part of the Northeast Blacksmiths Association, which will be holding its annual conference next weekend in the mid-Hudson Valley. There's also the Capital District Blacksmiths Association. Moran is planning more open house demonstrations. If you're interested in checking one out you can contact him at: bethlehemforge@yahoo.com. Not to get all finicky or anything, but it was never just about horseshoes. In fact, most traditional blacksmiths (stepfather is one) get their cackles up at such a thought. Those that make and fit horseshoes are farriers, and many blacksmiths want and have nothing to do with that side of the trade. Among the works of traditional blacksmiths were items as simple as nails, camp fire stove equipment, armor, swords, bits, tools (most of their own tools were self made), kettles, flatware, axe heads, and on and on. My mother has an iron rose--petals, thorns and all in great detail--by a blacksmith friend of theirs. If it can be formed at the anvil, it's probably being made by a blacksmith somewhere. This is great press. However the forge is mainly a meeting place for blacksmiths to share skills and encourage new smiths. We are not Cooperstown's Farmers Museum. James comment is right on. I want nothing to do with horses,they are too big. However we can all make iron roses. The blacksmith could ( before the computer ) fix anything except a broken heart and the crack of dawn. I use my hammer on the computer--it doesn't work but I feel better.